Xenia’s Samari Curtis defies gravity on a layup attempt on Saturday, Dec. 1, at Hillsboro High School where the Buccaneers took on Walton Verona in the Ohio Valley Hoops Classic. Lakota East’s Alex Mangold blocks the shot of a Dunbar player on Saturday, Dec. 1, at Hillsboro High School where both teams competed as part of the Ohio Valley Hoops Classic. 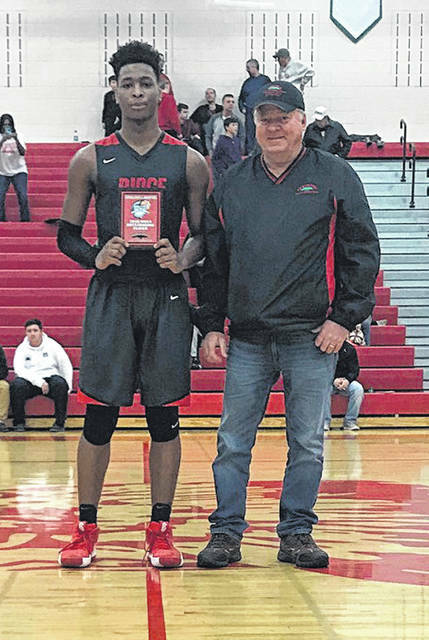 Walnut Ridge’s Von Cameron Davis receives his Most Outstanding Player plaque from Ronnie Ludwig of Sherwood Auto and Camper Sales on Saturday at Hillsboro High School following his record setting 46 point performance in the Ohio Valley Hoops Classic. 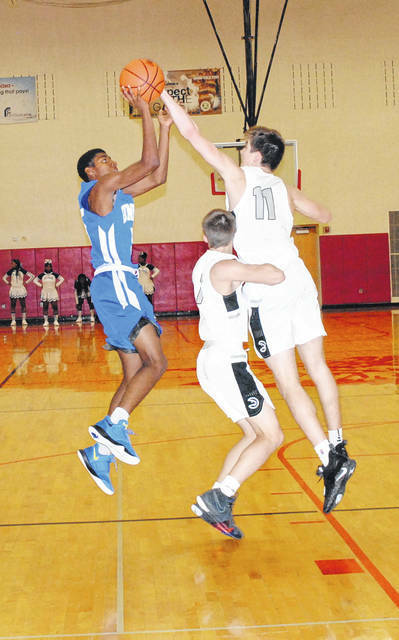 A weekend full of high school basketball at Hillsboro High School, which hosted the fourth edition of the Ohio Valley Hoops Classic, went off without a hitch according to organizer Bennie Carroll. The quality of competition was top notch at the event especially on Saturday when the OVHC team and individual scoring records were broken. The local Hillsboro Indians would have broken the team scoring record with their 89 point performance against St. Patrick (Ky.) if not for a 91 point showing by Beechwood (Ky.) in their matchup against Blanchester. 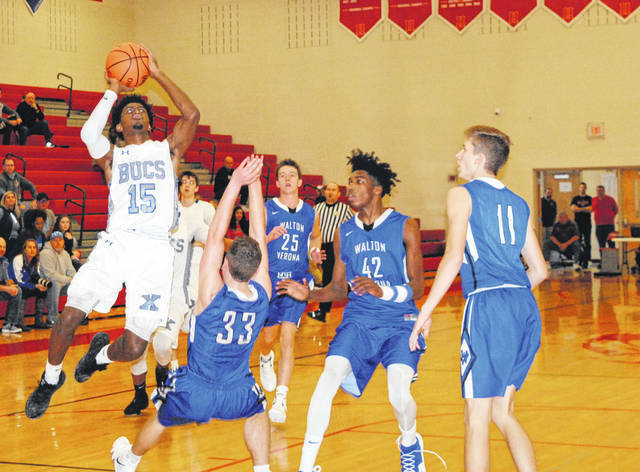 The individual record looked like it would be broken in the first game on Saturday when Xenia’s Samari Curtis put up 35 points in a loss to Walton Verona. Then, Beechwood’s Scotty Draud threatened the record when he scored 35 points in a win over the Blanchester Wildcats. The record finally went down when Walnut Ridge’s Von Cameron Davis exploded for 46 points in the Scots’ win over Cambell County (Ky.). “We had several scoring records broken on the weekend. The team scoring record got broken twice. The previous record was 87 from last year when Princeton did it. There was a lot of points,” said Carroll. Carroll was also happy to see that the players that were built up as being good heading into the OVHC showed up and displayed their talent effectively. Lastly Carroll took the time to thank all the sponsors for the event which includes: Sherwood Auto and Campers, Beford Ford Lincoln, Southern State Community College, JK Precast. Big Ernie’s Pizza, LaRosa’s Pizzeria, G & J Pepsi, Great Oaks Career Campuses, Wright State University, Highland District Hospital, CMH Regional Health Systems, Hillsboro Bible Baptist Church. Chad Abbott Signs, The Highland County Press, The Times Gazette, Five Points Implement, KFC, Quali-Tee Design Sportswear, Southern Hills Community Bank, H & R Block, Lowe’s, Hobart, Ponderosa Steakhouse, 24 Deli, Family Farm and Home, Roger Williams Auto. Snow Hill Country Club, Save a Lot, Community Markets, Harsha Monument Company, Kibler Lumber, ATSG, the Union Stock Yards, Merchant’s National Bank, The Laurels of Hillsboro, NCB, Alley 21, Carrie Zeigler-State Farm Insurance and BDK Lumber. https://www.timesgazette.com/wp-content/uploads/sites/33/2018/12/web1_Xenia-vs-Walton-Verona-15-Curtis.jpgXenia’s Samari Curtis defies gravity on a layup attempt on Saturday, Dec. 1, at Hillsboro High School where the Buccaneers took on Walton Verona in the Ohio Valley Hoops Classic. https://www.timesgazette.com/wp-content/uploads/sites/33/2018/12/web1_Lakota-East-vs-Dunbar-11-Alex-Mangold.jpgLakota East’s Alex Mangold blocks the shot of a Dunbar player on Saturday, Dec. 1, at Hillsboro High School where both teams competed as part of the Ohio Valley Hoops Classic. https://www.timesgazette.com/wp-content/uploads/sites/33/2018/12/web1_walnut-davis.jpgWalnut Ridge’s Von Cameron Davis receives his Most Outstanding Player plaque from Ronnie Ludwig of Sherwood Auto and Camper Sales on Saturday at Hillsboro High School following his record setting 46 point performance in the Ohio Valley Hoops Classic.